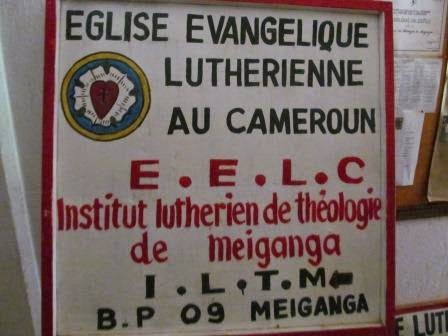 Last week I had the opportunity to teacha two-day seminar on pedagogy at the Institut Luthérien Théologique de Meiganga (ILTM – Lutheran Theological Institute of Meiganga). Guess what? We talked about writing objectives! This time (as opposed to the workshop ten days ago with Central African program leaders) students were writing objectives in preparation for teaching a brief lesson. Meiganga is about one hour northwest of Garoua Boulai on the road to N’gaoundéré. Rev. Dr. Elisabeth Johnson, the missionary who arrived in the area at the same time I did, is teaching New Testament (and other) courses at ILTM. Through her and the Director, Rev. Dr. Jean Koulagna, I was invited to teach this seminar to about 40 students. Their levels ranged from BAC studies (the formal – and difficult – test to demonstrate that one has finished high school), through undergraduate and Master’s levels. We met in the chapel – the room that is large enough to hold all the students at work. After the morning meditation, we turned the chairs around to face a black board kept in the back of the room. I took many of the concepts and activities that I have been using at the Bible School in GB and condensed them into 12 hours (11 hours + a one-hour exam). It was fun to work with these students. Of the 38 students three are women. I noticed immediately that their level of education and understanding is higher than the GB Bible School students (who only need the equivalent of an 8th grade education to be admitted). They could find the main idea much more easily and learned the material much more quickly as well. I had written the exam thinking of my usual students which turned out to be much too easy for them. Still, their doing well is an encouragement to them – and to me. In both Meiganga and Garoua Boulai, the students worked in small groups to read, understand part of Tutu’s text and then to prepare a 10-minute lesson. Because we had ten groups in Meiganga, not everyone had a chance to teach, but we did watch and critique seven mini-lessons. In GB there were only four groups so all taught (and I will include the group evaluation in their quarterly grade). Here’s hoping that you write (or at least think through) objectives and plan carefully so that you meet success in your work and play.